Do you need your garbage disposal repaired or replaced in your Orange, CA home? Call us today at (949) 371-8413 for all of repair, maintenance and installation needs. Garbage disposals are often not appreciated until they stop working properly. When serious issues like clogging and mechanical breakdown occur, it is necessary to call a plumbing contractor. Trust our Orange garbage disposal repair experts to get your disposal system working right! Our skilled technicians will arrive at your home as scheduled and will review the situation with your disposal & make any recommendations on repairs. In some cases it may be more cost-effective to replace an old unit with a brand new unit, rather than trying to come up with older parts that are expensive and hard to find. 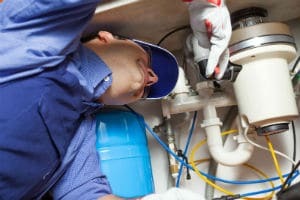 We pride ourselves on providing the quality of garbage disposal repair Orange residents will be extremely satisfied with and recommend to their friends needing a good plumber. Put our 15+ years of garbage disposal installation experience to the test and call us at (949) 371-8413 to schedule an appointment today. Home to a little over 140,000 people; Orange covers an area of around 25 square miles. There are many different fun and exciting activities to keep residents and visitors entertained throughout the year. One of the most popular attractions remains that of the Orange County Zoo. While not one of the larger zoos around, there are still plenty animals and other forms of wildlife to see. Kids can also spend time in the zoo’s petting barnyard – all for a cover charge of just $2. If you and the family need to engage in some retail therapy, The Outlets at Orange mall will certainly be the right place to go. With its array of outlet stores and the fact that it is open 24 hours a day, this mall is also extremely easy to navigate. Antique lovers will be pleased to know that the Orange Circle Antique Mall will be able to cater to their needs as well.